This Department is devoted to early clinical trials at Gustave Roussy. The Drug Development Department (DITEP) is tasked with offering patients, in whom therapy has failed, access to novel agents and with streamlining the development of new oncological drugs. It has been endorsed by the National Cancer Institute as a Centre for Early Clinical Trials (CLIP²). Since November 2016, the DITEP has obtained the ISO 9001v2015 certification (Quality Management System) for its activities of access to therapeutic innovations, management of early clinical trials, and scientific outreach. Work at DITEP is led by a multidisciplinary expert committee: medical oncology, immunotherapy, radiotherapy, haematology, imaging, laboratory medicine and pathology. Care is provided by a dedicated nursing team which is linked to all the professional input involved in clinical research: medical assistants, medical research assistants, research planners, clinical research associates and managers of blood and tissue sampling. In total, the team collaborating in the research programme counts more than 140 individuals. 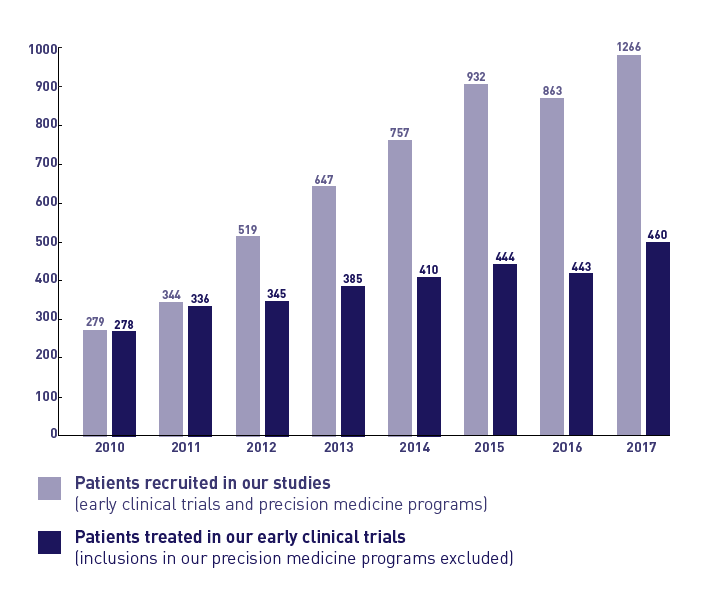 Thanks to the commitment at Gustave Roussy and to partnerships negotiated with the pharmaceutical industry and with biotechnology companies, DITEP is facilitating a constant growth in the number of patients gaining access to innovatory therapeutic agents. 1st cancer center in Europe, 3000 professionals mobilized.